This entry was posted in gardens, the view from here, Uncategorized. Bookmark the permalink. 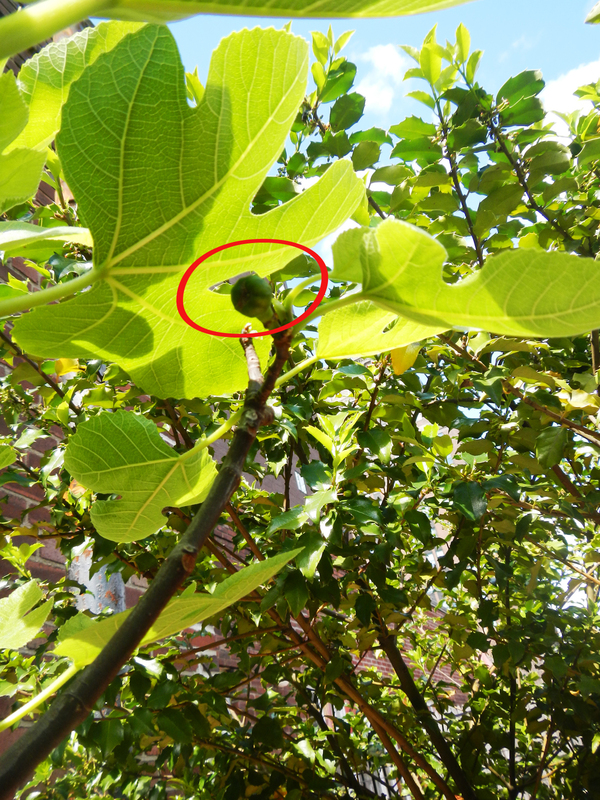 Thanks Gemma – that red circle is my first fig – and the rate the tree is growing, by the time you get here we will be making jam. Stay tuned! What spectacular photos! No wonder you are happy staying at home. I hope to get back there eventually. And thanks also for your post about Joe’s Pub. My sister and I went there two year’s ago (after getting a bit lost) and absolutely loved everything about it. Melbourne really needs a place like this! Thanks Annie. Yes, Joe’s Pub has a great ambiance and a huge variety of performers. Maybe you could start something similar in Melbourne…. Annie’s Pub….? Lucky you having such a great garden in the sky and such green fingers. Its beautiful. 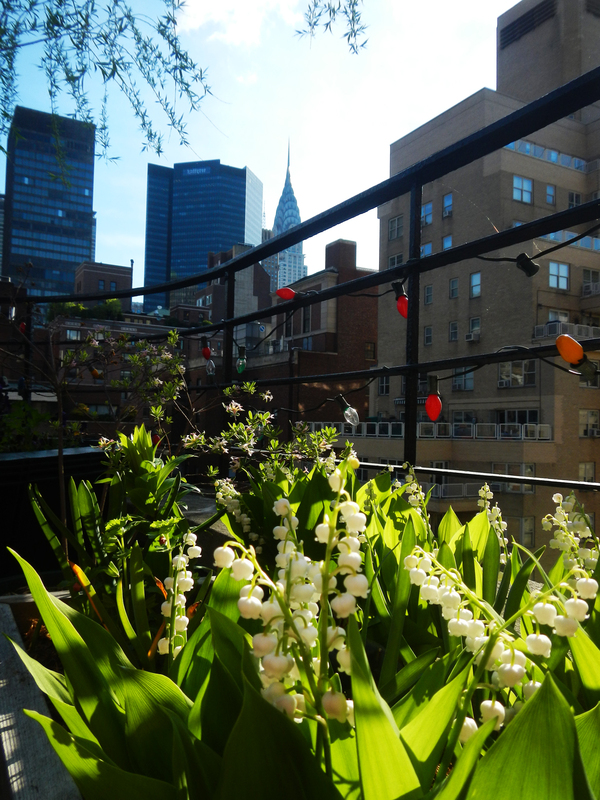 Thanks for your posts – I will get back to NY one day – such an invigorating city. Thanks June. 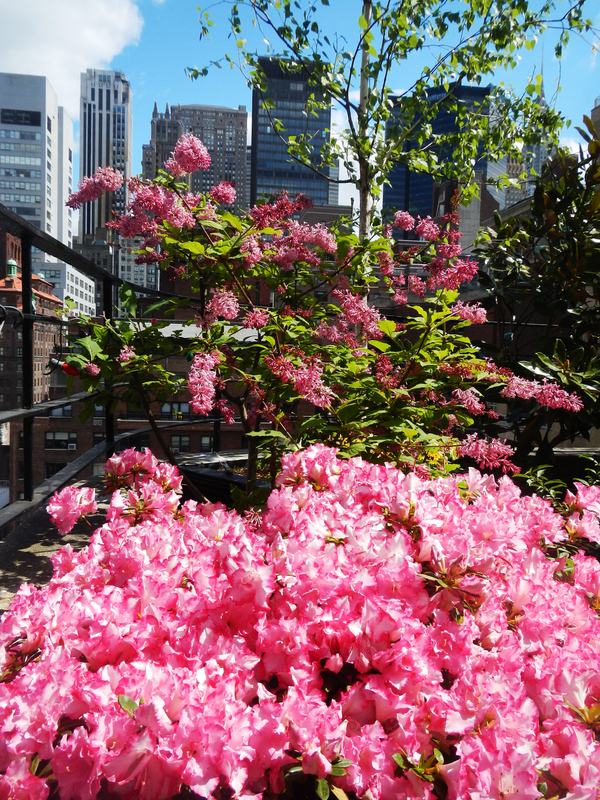 Yes, we are very lucky to have the apartment – after living with a garden all my life, I can’t imagine living without one. The Morgan Library below us is like a kind of valley and then the rest of the city rises up behind it. We can see other gardens around these urban hills so we can watch the seasons change even up here off the ground. It really is a beautiful spot. 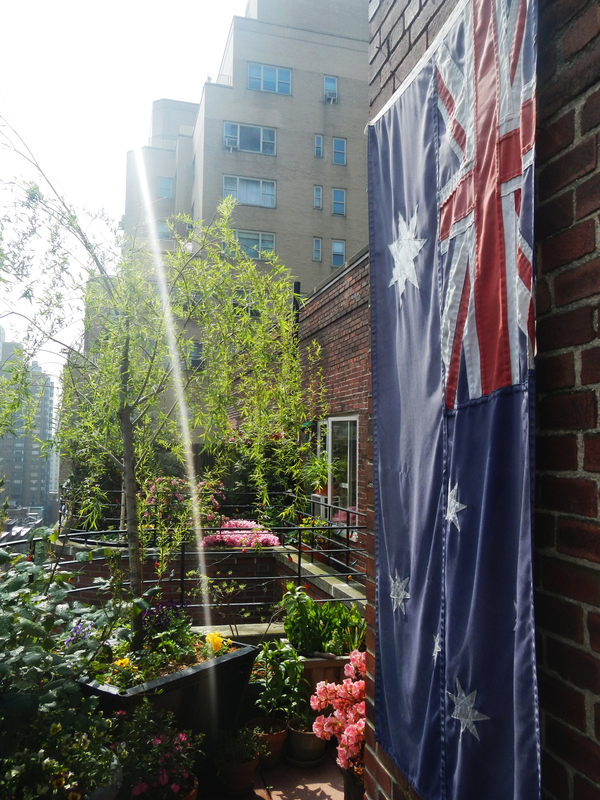 Gorgeous garden and all on the sky high balcony, I agree re good as Aussies at Chelsea! Thank you Shirley. It has been quite a learning experience to garden in pots, and to have frozen ground for months of the year. But the reward of Spring makes everything worth while. November will be a great time to come to NYC… Thanksgiving – fresh cranberries – pumpkins! I make a list of all the ‘good spots’ described on the blog. ‘Joe’s Pub’ sounds good. 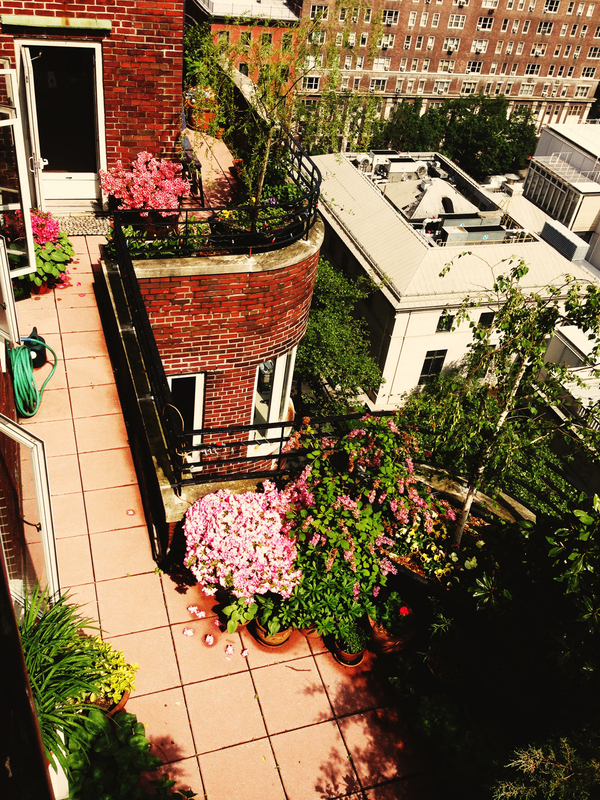 The garden balconies are gorgeous and show how we all have a need to grow things around us, even in the sky! Its 4 am Aussie time I was awoken to my hubby snoring earlier flicked the radio on with my head set heard your chat with Rod as I have done before in my waking hrs. .Thought as I couldn t sleep id have a peek at the flowers you mentioned and they are truly divine in such a small space. Thank you Wendy. Sorry you can’t sleep – although I’m happy to hear you were listening. Hopefully the scent of the lilacs will help you drift back to sleep…. I was awake as well and heard you for the first time, So motivated for our trip to NY in July. I will read your blogs to find out all the hidden secrets.I am a fellow South Aussie. Good to hear Gill and great that you are coming to NYC in July. Bring empty suitcases, good walking shoes and a hearty appetite!